There are some selections that one can make with the Differentials alone which, well, stand out like a sore thumb and they've been given the name of "Blindingly Obvious" selections by the members simply because they are. I will try to explain what they are here. This example is one of many that I could have selected, but at the time of writing (June 2014) this was one of the more recent ones noted. Looking at the top Class Differential list (page 54 of the Hexham 4.00) and two, or perhaps three, horses stand out in the Diff column. These would be Joe's A Boy, Lutin Du Moulin and, perhaps, Treehouse. But if we look further to the right then we can see that Joe's A Boy has 0.0 in the 'W Diff' column. This can only mean that Joe's A Boy has never won a Chase before though because he has a good figure in the 'Diff' column he has clearly run in chases before and is dropping in Class. Treehouse has a figure of 6.2 in the 'W Diff' column so this means that the average Race Class that he's won in is better than today's. This is a positive sign. But look at Lutin Du Moulin. Not only has his Class Differential given as 11.1 (which means he's running today in a Class eleven pounds 'better' than he has on average) but his Win Class Differeential is 12.1. This means that he's won chases which are, on average better than today's. That has to be seen as a huge positive. If we look at the next table, the Weight Differentials, then we see that Treehouse has a negative Weight Differential. In other words he's carrying two and a half pounds (more or less) than he has on average and his weight today is 8.4 more than his average weight carried when he won previous chases. So, this has to be taken into account. Joe's A Boy is eleven pounds lighter today than average and since he hasn't won before in chases there's nothing, as expected, in the right hand columns. Even though Joe's A Boy hasn't won before the fact that he's tumbling in terms of both Class and Weights he may well be entering his territory where he can win. But look at Lutin Du Moulin; he's got a positive Weight Differential of 10.1 pounds and a Winning Weight Differential of 7.7 pounds. Lutin Du Moulin is now looking to be very interesting and just from these figures alone he is worth following. The other two horses may also be worth following but everything does point to Lutin Du Moulin being well placed for this race. Though we can't see it here there are some other good indicators shown on the Summary Page for this race; Lutin Du Moulin is ridden by S Drake who with the trainer, C Grant, make a profitable combination. There is a positive indicator for the Distance Regression as well; in fact, it's the only horse with a positive distance indication like this . So, what happened in this race? Treehouse and Joe's A Boy both were pulled up but Lutin Du Moulin won by 21 lengths at 20/1. The comments in the Sporting Life said "Tracked leaders, led 13th, soon clear, easily". On the same day there was another Blindinly Obvious Selection; this time in the 2.40 Pontefract. For this example we're looking at Page 25 which is reproduced here below. The top rated horse, Whatsofunny, was a non-runner, so that can be discounted right away (and it would have been, blindingly obviously, a selection in its own right) so we have to look at the rest of the field. A number of horses with Positive Class Differentials do stand out here. 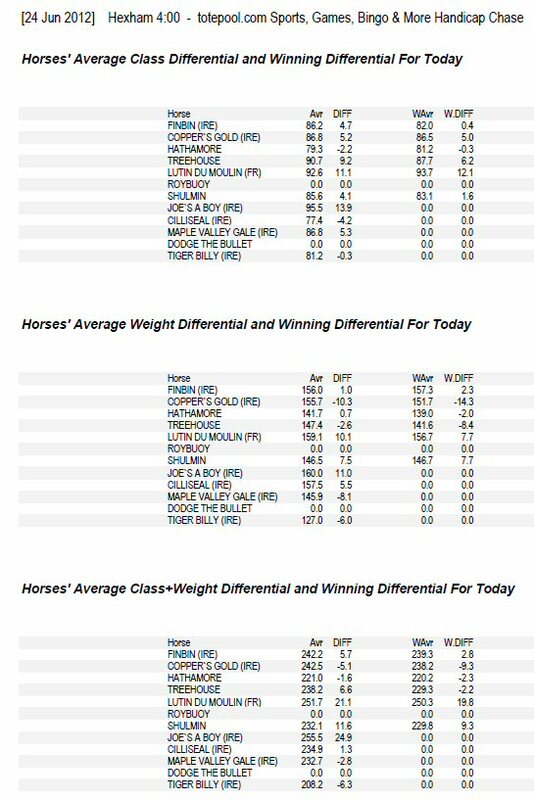 But only two horses which have good positive Class Differentials have decent Weight Differentials. 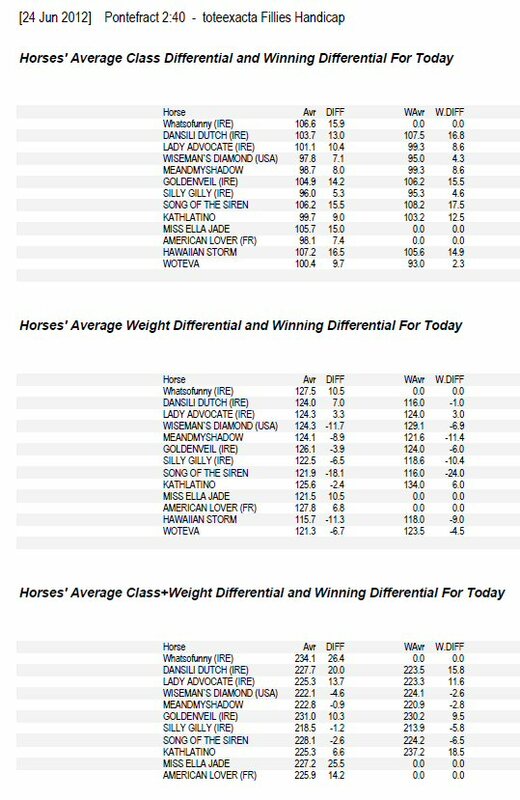 Because the third table, the Average Class+Weight Differentials, is based on adding the two averages together we can see that two horses really spring out at us. The new top rated horse, Dansili Dutch is one who has also won Flat races at a higher Class+Weight too and also Miss Ella Jade which is rated near the bottom but has a good Class Differential and also a good Weight Differential. Because Miss Ella Jade has 0.0 in the Win Columns of these tables it's clear that she's never won before but that massive fall in Class and Weight (15.0 and 10.5 pounds respectively) means that she has to be considered. But, without doubt the new top-rated, Dansili Dutch, has to be a selection because he's dropping in Class by 13 pounds, Winning Class by almost 17 pounds and Weight by 7 pounds. Her winning Weight Average is actually rising by a pound but given these numbers this can be forgiven. It's clear that just looking at these tables that we have two selections; Dansili Dutch and Miss Ella Jade. It could be argued for Lady Advocate to be a third selection and no argument against would be given if it were. So, what happened in this race? Dansili Dutch won by 6 lengths at 20/1. The comments in the Sporting Life said "Towards rear, headway over 2f out, went 2nd inside final 2f, ridden to lead over 1f out, edged briefly right and came clear final furlong opened 20/1 touched 22/1 ". Apart from grabbing a good priced winner, the most satisfying part was listening to the pundits on William Hill Radio after the race, scrabbling around trying to find a reason, any reason, as to why this horse should have won as easily as it did. They failed to find a single good argument, but looking at our Class Differentials it wasn't so hard for us, was it? What of Miss Ella Jade? Well, she came second at 40/1. Anyone with the foresight to back these two in an Exacta would, for their £1 stake, have walked off with over £1,100.